Vice President Leni Robredo’s lawyer, Atty. 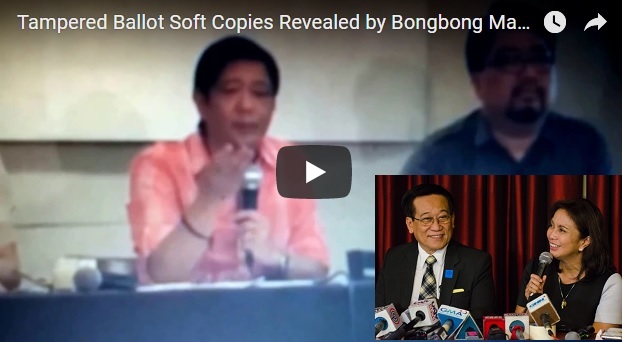 Romulo Macalintal said that the best way to prove if hundreds of ballots contain the questionable features shown by Bongbong Marcos is to investigate. They must compare them with the originals from the PET. Macalintal accuses Marcos of plotting the alleged self-serving copies. Can this be a bait for Marcos to react on possibly tainted images? Perhaps an attempt to discredit him once the election tribunal releases the master copies? Remember that the election tribunal denies his motion to get the original documents. [VIDEO]: Bongbong Marcos reveals that it is now clear why the ballot encryptions are only given to him partially. The presence of square marks and dots that tally with his undervotes can possibly explain the delay. Robredo’s counsel, Macalintal reacts on Marcos’ claim that his camp has solid and incontrovertible evidence of massive fraud in the 2016 elections. He said that it is highly ridiculous if not outright frivolous. The finding solely pertains to their own copies of ballot images from the pilot provinces of Camarines Sur and Negros Oriental, he clarified. In Marcos’s recent presentation, copies of ballot images from Barangay Salvacion in Tigaon, Camarines Sur, and barangays Poblacion and Jilocon in Negros Oriental show that his votes went to the undervotes category. Undervotes are invalid ballots. The voter either not voting for a certain position or there were unclear markings on the page. Marcos said that in some of the ballot images, even though two or more candidates were chosen in the vice presidential race, the votes still went for Robredo. It should go to the overvotes classification. He also questions the presence of square shapes in the ballot images instead of the oval ones additionally. Macalintal wonders that if these ballots with square scripts were in those precincts during the said election, Marcos’ poll watchers and supporters could notice them. They can raise their protest before the Boards of Election Inspectors, he reiterated. However, what Marcos said was, that they found square and dot markings on their copies. They are not on the actual voting ballots during the election 2016. He even said that his team doesn’t know what are they for? Robredo’s camp also dismisses Marcos’ claim that it colludes with the Comelec and poll technology provider Smartmatic to ensure her victory. “We challenge Marcos to immediately proceed with the recount instead of baseless and frivolous accusations. It only intends to destroy the integrity of the past election for his own personal benefit,” the veteran election lawyer said. Prior to this, Marcos’ challenges Robredo to withdraw her pending motions to hasten the resolution of the election protest.